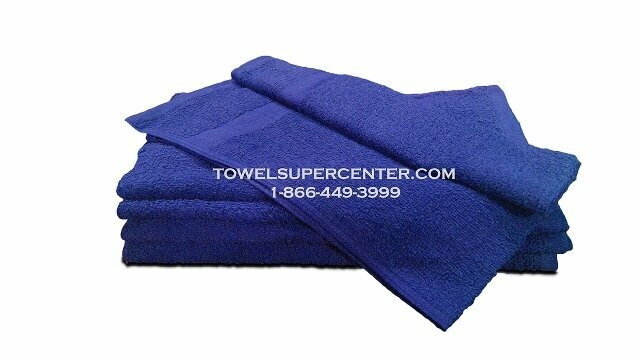 15X25-(2.4Lb) Hand towels Royal Blue in premium extra soft quality. Made of 100% cotton popular with hair salons, nail salons, gyms, schools, sports teams. There's no better feeling than knowing your clients are satisfied and happy with your services. From the services you perform to the amenities you provide, there's no shortage of things you need to accomplish to ensure your salon projects the polished and luxurious image you desire. What better way to take your company's look to the next level than by investing in top-quality accessories both you and your guests will enjoy? At Towel Super Center, we believe every towel should do more than just dry. Our poly-blend premium hand towels in royal blue add a stylish aesthetic to your salon or spa. As a spa or salon owner, you know that spills and messes can be inevitable. Just because your towels clean up messes doesn’t mean they have to look like one themselves. Invest in our wholesale premium royal blue hand towels for a towel that dries with both style and lasting quality. The beauty of blue is that it pairs well with virtually any color scheme. Does your salon have hints of blue in your preexisting décor or wallpaper? Does your salon go with mostly neutral shades? Regardless of your design or décor, our wholesale towels accent any room with an added splash of color. Often, many people prefer using a towel with a pop of color over a plain white hand towel to fulfill their drying needs. While white is a color that easily shows stains and spotting, navy blue is a deep hue that retains its color even after constant use. You don’t have to opt for a “loud” color that draws too much attention away from your decorations, either. Blue complements a variety of other colors while adding a sense of style and chicness to your salon or spa’s surroundings in the process. Comfort: Place towels under your customers’ necks before rinsing or washing their hair for added comfort. Cleaning: Mop up nail polish, tanning sprays and dye spills without worrying about unwanted stains or blotches sticking around. Drying: After rinsing and washing hair, quickly dry your client’s hair with our quick-wicking polyester blend towels. With savings this good, why would you want to pass up on a wholesale order of our premium royal blue hand towels? You'll save yourself both time and money by investing in a premium product your business will never run out of throughout the day. For more information on our products or to receive guidance with your purchase, contact one of our friendly representatives today. We are confident every order you place at Towel Super Center will exceed your expectations while fulfilling all of your daily drying needs.